Alderman Shiller says Uptown residents are suing to dismantle the Wilson Yard TIF for the wrong reasons. But so what? For years I've been calling on residents to rise up against our city's tax increment financing program, which siphons hundreds of millions of dollars in property taxes each year into accounts controlled by Mayor Daley. Well, last week a group of residents in Uptown did just that. Fix Wilson Yard, as the group calls itself, filed a lawsuit in Cook County Circuit Court to dismantle the long-controversial Wilson Yard TIF and turn over the roughly $28 million it's already collected to the Park District, public schools, and other governmental entities. It's about time... though at the risk of sounding ungrateful, I have to say the fight is against one of the few TIFs that might actually benefit someone other than the mayor and well-connected developers. The CTA operated a bus barn and storage facility on the 5.7-acre plot known as Wilson Yard, under the el tracks between Montrose and Wilson along Broadway, until 1996, when it burned down. 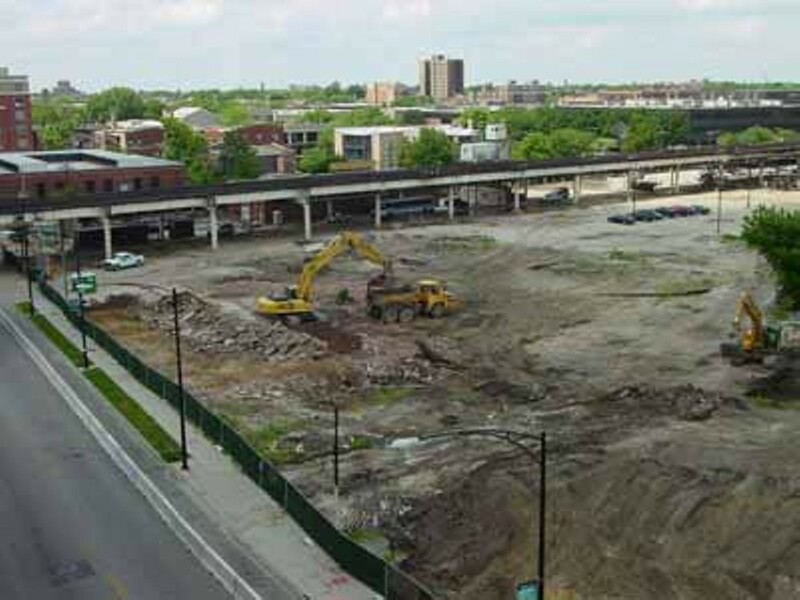 Within a couple years 46th Ward alderman Helen Shiller began convening local residents and business owners to come up with a development plan, and in 2001 the city created the Wilson Yard TIF to facilitate development of the site. In many ways the battle over that development has been a microcosm of the war waged between Shiller and her foes since she first got involved in neighborhood politics 30 years ago. The bottom line is that she's for affordable housing and they think she's trying to cram too much of it into Uptown. After almost three years of meetings Shiller settled on a plan that called for a movie theater, a Target, reconstruction of an existing Aldi, several smaller stores and shops, and a mix of affordable and market-rate housing. Over the years, though, that plan was modified. The new Aldi was built but the theater was scrapped. And the housing plan—the most controversial part—kept evolving. It's now to consist of two ten-story buildings of affordable housing: one with 84 units for individuals and families and the other with 99 units for seniors. And to help pay for it all, there's our old friend the TIF: the project is now expected to use $62 million in TIF funds, which could cover more than a third of the total price tag. For loyal readers who are well aware of how this baby works, bear with me. When the City Council, at Daley's urging, creates a TIF district, it's essentially announcing that the area within these boundaries is so blighted, or so close to being blighted, that no developers would put their money there without a little help. To fight the blight and spur development, the city freezes the property tax take in the district for up to 24 years and creates another account for any extra revenue that comes in due to higher assessments, new developments, and the like. Whatever property owners in the district are paying when the TIF is created, that's all the city, county, schools, parks, and other taxing bodies will get for the life span of the TIF. Meanwhile there's barely any oversight for how Daley and the local alderman spend the funds that accumulate in the TIF account. Cook County assessor Jim Houlihan likes to call it "funny money"—and like in Monopoly, there's no penalty for blowing it on the wrong block. Because the schools, parks, the county et al can't get any extra money out of the district for 24 years, they have to increase their tax rates to compensate. The more TIF districts the city creates, the more it forces these bodies to raise tax rates—and the more Chicago taxpayers have to cough up. What's more, their property tax bills don't show how much is going to the TIFs, even when they live in a TIF district. In 2007 the TIFs collected about $555 million this way, up from $500 million in 2006. All told, the TIFs have collected more than $2.5 billion since 2000. But the program is so complicated and, as you can see, takes so long to explain that it's rarely covered in the mainstream media. And how is the money used? Tens of millions of dollars in assistance for a car dealership at North and Clybourn, the Rush University Medical Center campus, renovations at Loyola University, condos in Logan Square, the underground train station at Block 37 that will probably never get finished (much less used), Block 37 itself—oh, don't get me started. Measured against these inside deals and boondoggles, the $62 million in TIF money earmarked for Wilson Yard—even if it is way up from the original allotment of $26.5 million—looks like a noble expense. After all, as Shiller points out, much of the money will be used to build senior citizen housing—and how in the world can you be against housing for seniors?—which but for the TIF would not be constructed. But the point of a TIF is not to build senior citizen housing, noble as that may be. It's to develop land in a blighted community that but for the TIF would never have been developed. Shiller insists that the land at Wilson Yard would have forever remained vacant without the TIF. "This could not have been done without a subsidy," she says. Her opponents vehemently disagree. Wilson Yard, they point out, is one of the largest tracts of prime undeveloped land in the city. If the CTA, which owned it, had put it up for sale back in the go-go late 1990s or early 2000s, it probably would have attracted a legion of deep-pocketed developers eager to make a bid. But the CTA sold the property to the city for the under-market price of $6.6 million, or $27 a square foot—the nearby Rainbo Roller Rink site had gone for $54 a square foot two years before, and that was low for the area—to help the project. Think about that as you wait in the cold for trains that never seem to run on time and get ready for yet another fare hike. "You know as well as I do that this land doesn't need a subsidy to be developed," says Katharine Boyda, a plaintiff in the suit and a member of Fix Wilson Yard. "This is one of the most valuable parcels on the north side." As Shiller observes, some of the plan's opponents couldn't care less about TIF abuse. Had Shiller and Daley cooked up a scheme to spend $60 million on, say, upscale condos and a Lord & Taylor, they'd be jumping for joy. If Shiller's using the wrong tool to do the right thing, the residents are fighting the right battle for the wrong reasons. But so what? The suit hits the TIF program where it's most vulnerable. It says the TIF is illegal because the area is not really blighted and would have been developed even without it—a criticism that could also be leveled at all the TIFs in and around the Loop. It accuses the city of breaking the rules governing the creation of a TIF. It says the TIF "will cost the city, its taxpayers and other taxing districts, such as the Chicago Public Schools, untold millions of dollars in lost tax revenues." It requests that the TIF be declared "null and void." Shiller says she hasn't seen the suit, but she calls it a publicity stunt by political opponents who want to run someone against her in 2011. "It's political," she says. "The project has everything that everybody wants—it's going to create jobs, retail, and affordable housing." City law department spokeswoman Jennifer Hoyle says she hasn't seen the suit either and can't comment on any particulars. She adds, "We believe that the TIF is in compliance with Illinois statute." But the city has to take this lawsuit seriously. If the residents in Uptown prevail, their success will encourage other lawsuits against other TIFs—or, at the very least, keep the city from creating new ones. They're threatening to cook the golden goose. "Somebody has to say we've had enough," says Boyda. "This has nothing to do with Mayor Daley as a person—it's about a policy that's sucking the life out of the city." At press time no court date had been set, but sometime in the next couple weeks the plaintiffs are expected to go before Judge Mary K. Rochford to ask for a restraining order preventing the city and lead developer, Peter Holsten, from doing any more work on the project. I expect the city to demand that they post a six-figure bond to cover any cost overruns that occur because the case delays construction. If the judge orders the bond, the suit is probably over, because it's typically hard for citizen groups to raise that kind of money. But Thomas Ramsdell, the lawyer for the residents, predicts they'll convince the judge that ordering a bond is prohibitive. He reminds me that he convinced a different judge to deny the city's request for a bond in the case over the Lincoln Park soccer field built at the behest of Latin School. The other lawyer for the residents, Champ Davis Jr., points with pride to a lawsuit he won a few years back, killing a proposed TIF district in Burr Ridge. Ben Joravsky is interviewed about this and other columns on the Mr. Radio podcast, mrradio.org/theworks. For more on politics, see our blog Clout City.